ALBANY – James W. Keech, Sr., 87, of Albany, passed away peacefully surrounded by his family on Sunday, March 31, 2013 at St. Peter’s Hospital. James was born in Moriah, NY, on September 3, 1925 to Oscar and Mabel Keech. He served in the U.S. Army during World War II in the infantry division. After his military service, he worked at Capital City Container and at CDTA. James was a devoted husband to Theresa Weber Keech for 65 years. 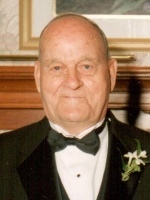 In addition to his loving wife, James is survived by his four children Norma Decker (Michael), James Keech, Jr. (Linda), Linda Keech Silberman, and Stephan Keech (Annette); his grandchildren Jennifer Decker, Jessica Decker, Megan Decker, Theresa Decker, Gordon Miller (Aileen), James Keech, Stephan Keech, Jr., Katlyn Keech, Robbie Silberman; and by his great grandchildren Connor and Anna Miller, and Michael Keech. He was predeceased by his son in law Richard Silberman. Funeral services will be held in the Hans Funeral Home, 1088 Western Ave., Albany, Saturday morning at 10:00. Relatives and friends are invited, and may call at the funeral home Friday from 4-8 p.m. Interment will be in Memory Gardens, Colonie. To leave a message of condolence for the family, send a sympathy card, or obtain directions to the funeral home, please visit www.HansFuneralHome.com. Click here to view Mr. Keech’s resting place in Memory Gardens, Colonie, New York.